When you are hauling your home down the highway, you should also remember to take along your garage by carrying along a well-stocked toolkit. At some point, you are likely to find yourself needing to make a repair requiring a tool. If you are lucky, this will happen while you are at a campground in an area surrounded by stores. Unfortunately, it could also happen while you are on the open road, miles from civilization. Carrying a good selection of tools will save you time and stress when problems occur. The most important toolkit items are those that can help you in an emergency. If you are stranded on the side of a highway, items such as traffic cones, reflectors, or emergency flares can alert other drivers to your location. A jack, a lug wrench, and battery cables are essential for the most common types of breakdowns: flat tires and dead batteries. Consider purchasing fix-a-flat tire sealant or a tire repair kit, as well. Finally, a first-aid kit is critical, in case you have a medical emergency or injury. Having a good set of common tools is vital. Be sure to include wrenches, pliers, a hammer, screwdrivers, rope, a small saw, a drill, a socket set, a razor blade, and a level. A tire gauge and/or tire pressure monitoring system is necessary for what is arguably the most important part of your RV: the tires. If you have room, a small air compressor is a worthwhile investment. Additionally, if you plan to do any DIY electrical work, be sure to add electrical tape, electrical pliers, a voltmeter, and 14-guage wire to your toolkit. Before stocking your toolbox, get familiarized with your RV’s many components. Water can be a source of frustration when leaking through the roof or pipes. Be prepared by having plumber’s tape and plumber’s putty on hand. Check to see what types of fuses are commonly used in your RV, and keep the necessary replacements in your toolkit to spare yourself from a long power outage. Similarly, keep spare light bulbs since the type you need for your rig may not easily be found in regular stores. Finally, a digital voltmeter is a very useful tool if you regularly rely on your battery since these provide the most accurate readings. Sometimes, the simplest items are the easiest to overlook but can provide a lot of assistance. Keep a good flashlight on hand for nighttime repairs or for use in dark spaces. A good set of gloves can come in handy if you are dealing with a messy situation. Various types of glues and adhesives may also be useful. WD-40 can be especially helpful in tight situations. Finally, never, ever underestimate the power of duct tape for fixing a variety of ills. These recommendations are far from comprehensive; however, you will be well on your way to building a basic RV toolkit once you add these items to your rig. Follow the Boy Scout motto, and be prepared. 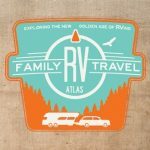 Jeremy and Stephanie Puglisi are the founders of the RV Family Travel Atlas podcast and website. They spend over 40 nights a year in their RV traveling with their three young sons.